The Hour of Code week is upon us and we are participats here at Ka Waihona o ka Na`auao PCS! During the week of December 4-8 our haumana will join other students from around the world in this worldwide event. Explore the world of coding with your child using the many activities available at code.org/ . Let your child show off their coding skills or better yet, let them teach you how to code! Students in Kindergarten through the 6th grade will participate in the Book It! Program starting this October. For the next six months, classroom teachers will set monthly reading goals for their students. When students meet their reading goal, students can earn a coupon for a free personal size pizza! The award coupons can be redeemed within the following month as it expires in 30 days. Please encourage your child to participate in this literacy program. You may also visit www.bookitprogram.com for more information and parent resources! 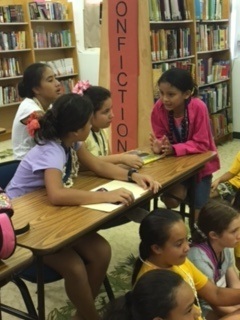 Mahalo to all that came to support our Fall Book Fair! We saw many smiling faces of students, siblings & teachers when they could leave with books they had their eye on! We're looking forward to the next Scholastic Book Fair in spring. Here is some general information regarding our KWON library. Students may borrow and return before school, after school, and during recesses. K - 4th: Classes are scheduled to come once a week for borrowing & a lesson. 5th - 6th: Classes are scheduled at to borrow once a week or every two weeks depending on how your Kumu's preference. 7th-8th: Students may come on their own. Students may borrow items for a one week period and are also allowed to "renew". If a student looses or damages a book, they will be responsible to pay for the replacement cost. 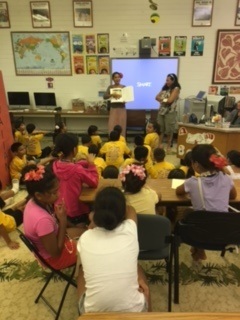 This summer the Hawaii State Public Library System will be having their annual Summer Reading Program. All 50 branches will be participating and celebrating reading with the theme "on Your Mark, Get Set, Read". There will be incentives for reading, as well as free educational activities. I've posted a listing of Waianae Public Library's planned summer activities for families and children. The Summer Reading Program is open to all ages with programs for ages 0-5, K-5, Teen, and Adults. This year participants will be recording the number of minutes read per week, instead of the total number of titles. I hope you are able to participate in this fun and educational activity this summer. Happy reading and have a safe summer!! 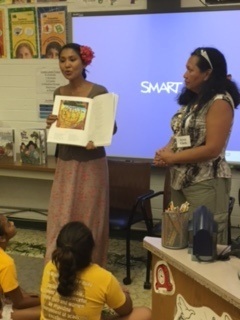 We were honored to have students, accompanied by teachers and parents, from the school Ecole Toa'ta of Tahiti. 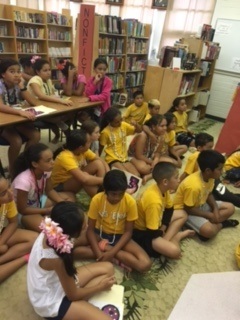 They spent three days at Ka Waihona o ka Na`auao and within that time a small group of students were able to join Kumu Keli`i's fourth grade students to their library resource class. Students enjoyed exploring the library and appeared eager to browse through books written in English. We were fortunate to have parents, Lisa Juventin and Sylvie Clark, read a fable from a book the visiting group graciously donated to our school's library. 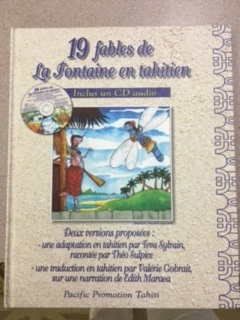 Lisa translated and explained the fable in English while Sylvie read it in Tahitian. It's such a beautiful language (in my opinion). Their visit was a special treat! Thank you very much to our new friends. Or as they say, Maruru Roa!! The library was the site of our Scholastic Book Fair last week! During class time, students were able to watch a Scholastic book fair movie previewing some of the books available this fair. Students gained some insight when children's authors and illustrators shared their inspirations and introduced their books. It was an enjoyable week!! 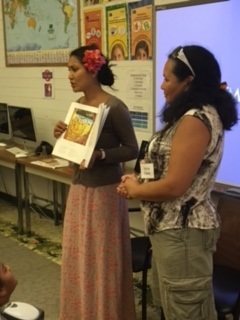 Mahalo to all of you who came to enjoy the book fair! Visit us in the library and browse through our Spring Book Fair happening April 11th - 15th. The library will be full of books for all ages and accessories for purchase from Monday - Friday.